Other photos: 2012 Cruisers Yachts 540 Express, Bow Sun Lounge, Windlass With Anchor Package, Swim Platform Seat, Catalog Image, Catalog Image, Catalog Image, Catalog Image, Catalog Image, Catalog Image, Catalog Image, Catalog Image, Helm View, IPS Joystick Control, Catalog Image, Catalog Image, Catalog Image, Catalog Image, Catalog Image, Catalog Image, Catalog Image, Catalog Image, Forward Stateroom, Master Stateroom / Catalog Image, Catalog Image, Catalog Image, Master Stateroom / Catalog Image, Catalog Image, Catalog Image, Engine Room, Engine Room, Engine Room, Engine Room, Engine Room, Engine Room, Catalog Image. Any boat can get you from here to there. But it takes an inspired yacht to effect a transformation in one's life. 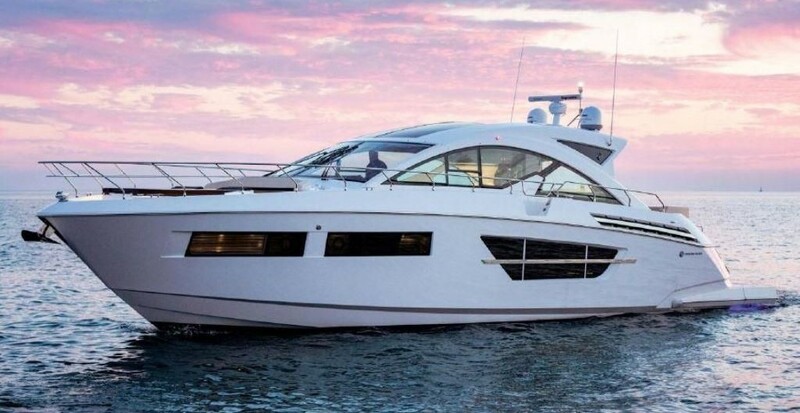 Implicitly designed to transport your days from ordinary to extraordinary, the sleek 540 Sports Coupe comes amply appointed with innovative features for you and all your guests. Step aboard, let the luxurious amenities surround you, and assume the life you were meant to live. Equipment Includes: Black Hull, Black Diamond Interior w/Wenge Cabinetry, " Light Maple" Amtico Galley Flooring, Air Conditioning With Heat, 15.5 KW Generator With Sound Shield, Cockpit Wet Bar With Grill, Ice Maker And Refrigerator, Bow Chaise Sun Lounge, Windlass With Anchor Package, Electric Helm Seat, Salon Sofa / Sleeper, Convection Microwave Oven, Dishwasher, Refrigerator / Freezer, Electric Cook Top. Salon Stools, Salon, Master And Forward Stateroom TV/DVD, Wenge Entry Treads-Cabin, Washer / Dryer, Automatic Bilge Pump With Alarm, Algae-X Fuel Conditioning System, Anchor Wash Down System, Engine Oil Change System, Opening Portholes, Cockpit TV, Underwater Lighting, Cockpit Carpet, Hardtop With Full Black Canvas Enclosure, Centrifuge Heads With Holding Tank, Automatic Fire Suppression System, Carbon Monoxide Detectors, Bottom Paint. SYS Yacht Sales is pleased to assist you in the purchase of this vessel. This boat is centrally listed by Spring Brook Marina.